Dr. Wesner is responsible for the management of the Abrons Student Health Center which includes medical services, pharmacy, health promotion and crossroads. She is responsible for policy development and implementation, budget management, public relations, and personnel. Katrin is a member of the Board of Directors for the American College Health Association. She has been with the Student Health Center since January of 2007. This position oversees Medical Records, Nursing, and the Lab. She also is responsible for Immunization Compliance. Agnes provides support to the Director and Associate Director, as well as functioning as office manager. Agnes has been with the Student Health Center since May of 2016. Dr. Laughlin oversees medical care in the Student Health Center. He provides direct patient care and is the supervising physician for the Nurse practitioners and Physician Assistants at the Health Center. In addition, he serves as consultant and adviser to the University for a broad range of issues, from individual health care to community well-being. Dr. Laughlin is active with the NC Coastal Federation. Walt has been with the Student Health Center since April of 2008. Dr. Baldwin is a Staff physician in the Student Health Center. She provides direct patient care to students, and serves as backup for the Medical Director. Rachel has been with the Student Health Center since July of 2011. Lora is a Physcian Assistant in the Student Health Center providing direct Patient care to students. Lora has been with the Student Health Center since November 2016. Melissa Rice, PA-C, is one of two psychiatric PAs at the Student Health Center. In addition to being a PA, Melissa has a Masters Degree in Psychology and has held various job roles in the mental health field including crisis intervention specialist, case manager & behavioral health program supervisor. Melissa joined the Student Health Center staff in May 2018. Katie is a Family Nurse Practitioner in the Student Health Center providing direct patient care to students. Katie has been with the Student Health Center since October 2017. Nancy is a Physician Assistant who provides direct patient care. She especially enjoys challenging cases. 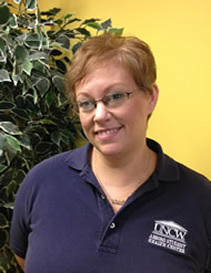 Nancy graduated from UNCW with a BA in biology in 1994 and graduated from PA school at Wake Forest University in 1997 with honors. She previously worked in Internal Medicine and Family Practice. In her spare time she likes outdoor activities including backpacking, kayaking and running. Nancy has been with the Student Health Center since February of 2002. Melissa is a Physician Assistant and is certified in general practice with a specialty certification in psychiatry. She diagnoses and treats physical and mental health issues that affect the mind and body placing an emphasis on patient education, prevention and wellness. Melissa has been with the Student Health Center since February of 2012. Becky has been a Registered Nurse for 17 years. She previously worked in critical care, occupational health and pediatrics. She is very excited to be working with UNCW students and loves living in coastal North Carolina. Becky has been with the Student Health Center since July of 2014. Ranae is one of the nurses in Student Health and her job consists of working with students in a health care setting, utilizing nursing skills and offering TLC when necessary. Ranae has been with the Student Health Center since January of 2005. 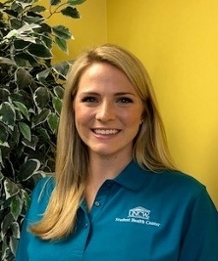 Cassie is responsible for all aspects of medical records from scheduling and checking in student appointments, answering the telephone, maintaining the patient charts and assisting the students with immunization and insurance requirements. Cassie has been with the Student Health Center since January of 2013. Tarita is responsible for all aspects of medical records from scheduling and checking in student appointments, answering the telephone, maintaining the patient charts and assisting the students with immunization and insurance requirements. Tarita has been with the Student Health Center since January of 2015. Tabitha is responsible for all aspects of Insurance & Referrals. She also assists Medical Records. Tabitha has been with the Student Health Center since January of 2015. Pam is responsible for all aspects of medical records from scheduling and checking in student appointments, answering the telephone, maintaining the patient charts and assisting the students with immunization and insurance requirements. Pam has been with the Student Health Center since December of 2010. Dr. Gierie manages the Pharmacy. She dispenses medication on prescriptions from off campus prescribers, as well as Student Health Service providers. Each encounter with a student is used as an opportunity to counsel and educate. Advice is also given on over-the counter drug selection and usage. Heidi has been with the Student Health Center since October of 2010. 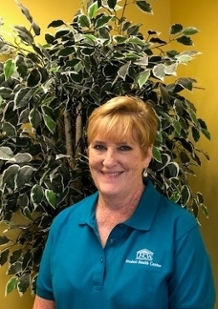 Lynn assists the pharmacist in all aspects of dispensing, inventory control, and daily accounting procedures, as well as acting as a cashier for the Student Health Center. Lynn has been with the Student Health Center since September of 2007. 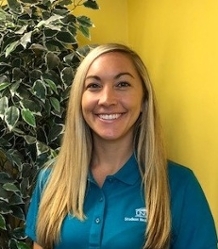 Kayla is responsible for all phases of clinical laboratory testing, quality assurance, quality control, instrument maintenance, policy and procedure manuals, test method development. Dr. Lane is responsible for overseeing Health Promotion, Crossroads, and the Collegiate Recovery Community. Health Promotion includes educational activities and programs concerning sexual health, sleep and stress management, sun safety, cancer prevention, men's and women's health, and general health and wellness. This position supervises the alcohol and other drug conduct interventions on campus and is a resource for any substance use concerns students may have about themselves or someone else in their life. Nicole received her B.S. in Psychology and her M.S.Ed. in Community Counseling at Western Illinois University, and is a licensed professional counselor in the state of North Carolina. 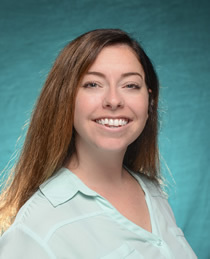 Nicole has been at UNCW since September 2017. The Campus Dietitian provides individual nutrition consults for UNCW students. In addtion, this position is responsible for educational activities and programs that address students' nutrition issues. Chelsea has her Master's Degree in Human Sciences and a Bachelor's Degree in Human Ecology, and is a registered Dietitian. This position supervises and manages the Health Promotion and Crossroads Peer Educators and is responsible for health and wellness programming on campus. This position is also available for individual appointments concerning sleep and stress management, sexual health, sun safety, tattoo and piercing safety, cancer prevention, and general health and wellbeing. Meghan also coordinates the Collegiate Recovery Community programs. This position provides administrative support for Health Promotion, Crossroads, and Collegiate Recovery Community.